I admittedly jumped head first onto the tattoo bandwagon back in the 90’s when everyone was getting “inked” to represent whatever was going on their lives, be it a relationship, a favorite band or even just the angst they were feeling. I was really into astrology at the time and decided that a tattoo of a Pisces symbol made sense: I would forever and always be a Pisces and so I couldn’t get sick of it. Flash forward twenty years and the tattoo was not only getting in the way of acting roles (it takes hours to cover it up properly) it was no longer looking fresh. 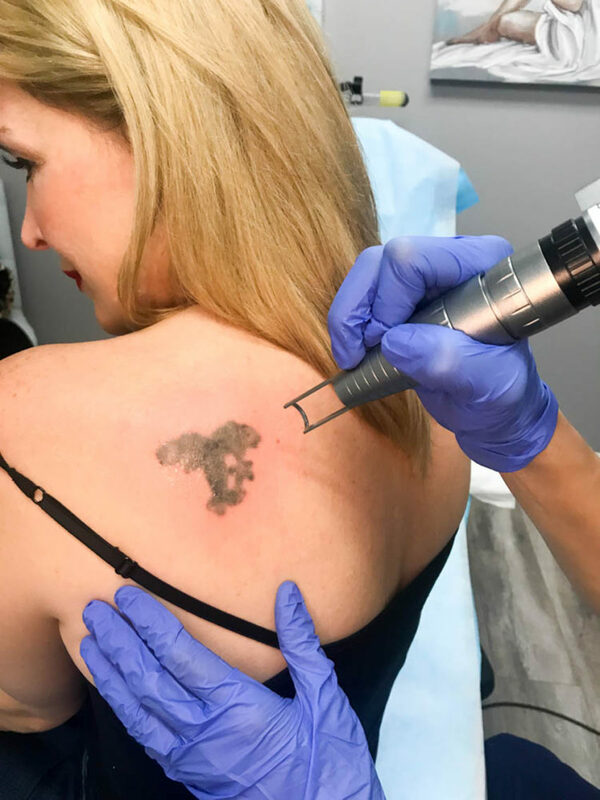 I had been planning on getting laser tattoo removal for years and would sporadically get serious about it, research different clinics and then I would again put it on hold and ultimately forget about it and then the cycle would start all over again. 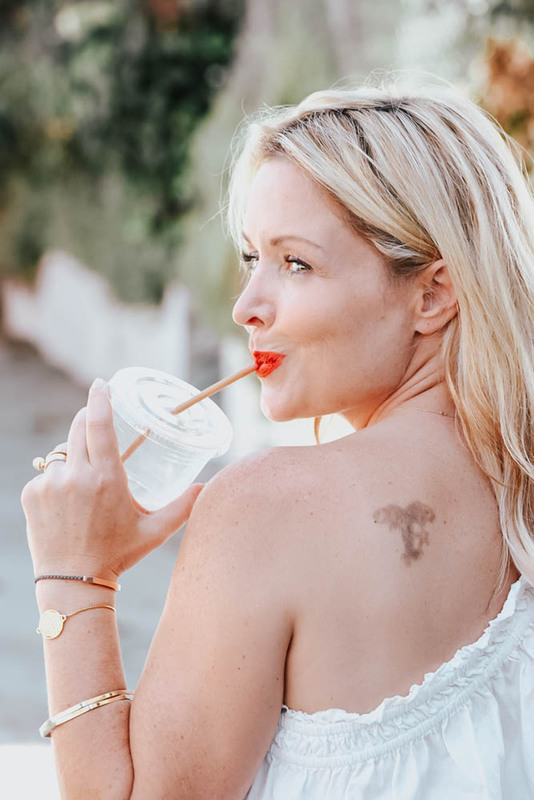 Late last year I was invited to MD Aesthetics in Sherman Oaks for a “Hollywood Facial” which I loved the results of, I later found out that its the same laser machine that is used for laser tattoo removal just used at a much higher level. That was the moment that I made the decision to go for it and get rid of this undesirable mark on my shoulder forever! 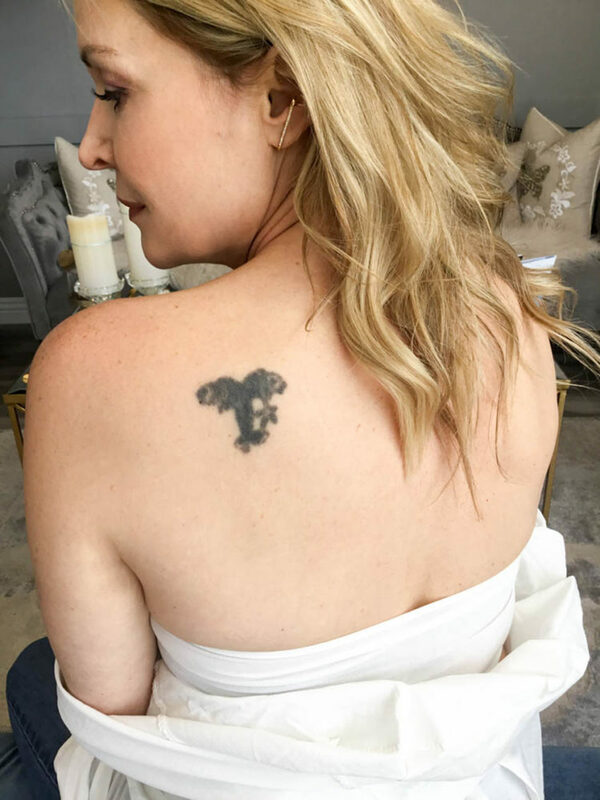 I was told by the technician at MD Aesthetics that I was a very good candidate for complete laser tattoo removal in the least amount of sessions because of my fair skin, the uniform color of the tattoo (all black) and the fact that it was already breaking down on its own. The first photo shows my tattoo after only four sessions! The second photo is on day one so you can see how much it has already faded. I don’t really even count my first session since I didn’t come in early enough to leave the numbing cream on long enough to withstand three passes of the laser. I am not going to try to sugar coat the amount of pain that is involved. I knew there would be quite a bit of pain but it is exponentially more painful than I could have imagined or even describe. The subsequent sessions I have made a concerted effort to come in an hour earlier than my appointment to let the lidocaine take effect so I could get the most out of each round, now they go over the tattoo three times each session. The gals at MD Aesthetics do everything they can to lessen the pain with cool air blowing while lasering and keeping me comfy with lots of pillows! I’m going in for my fifth laser appointment today so check out my Instastories for a peek into process! Feel free to ask any questions if you’re thinking of tattoo removal Im happy to answer! Technology truly is amazing. Way to go dear. How many sessions does it need to completely erase a tattoo? Can they completely erase it, or will it still leave some marks? Anyway, thanks for sharing your experience dear.